Open space has always been a premium in Towson, and Southland Hills has a 1.8 acre acre park that is available for both residents and not-residents to enjoy. The local YMCA is also just a short walk from the neighborhood and if you enjoy parades, then all you have to do is walk a couple of hundred feet to get one of the best seats see it on Bosley Road. Because it is so close to the center of Towson, Southland Hill residents are the envy of many Towson residents because they can walk to all of the shopping and dining options that Towson has to offer. 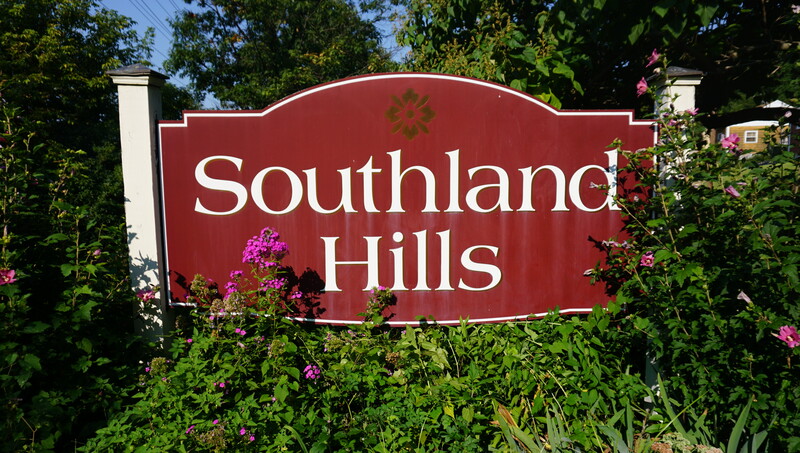 Ready to check out all that homes for sale in Southland Hills has to offer? If so, give me a call at 443-564-0952 or send me an email. I will be happy to create a free, no obligation automated home search for you that will deliver homes meeting your criteria directly to your email. Once you have identified the homes for sale in Southland Hills that you want to see we can schedule a visit. PRIZED RUXTON RIDGE RANCHER-LIVING ROOM W/BOW WINDOW & FIREPLACE-DINING ROOM OPEN TO KITCHEN AND DEN-KITCHEN W/GRANITE COUNTER TOPS, STAINLESS STEEL APPLIANCES, INDUCTION RANGE, & DESK AREA-FOUR MAIN LEVEL BEDROOMS-MASTER SUITE W/UPDATED BATH AND TWO CUSTOM CLOSETS-UPDATED HALL BATH-DAYLIGHT LOWER LEVEL W/FAMILY ROOM OPENING TO BLUESTONE TERRACE-MASSIVE PLAYROOM-OFFICE THAT COULD BE BEDROOM #5-HALF BATH-LARGE LAUNDRY ROOM-BIG CEDAR CLOSET-BEAUTIFUL PERRENIAL PLANTINGS-COVERED BLUESTONE TERRACE WITH CUSTOM STONE PLANTERS-STORAGE SHED-NEW ROOF 2018-WALK TO WEST TOWSON ELEMENTARY-SO CLOSE TO TOWSON, I-83 & I-695-TERRIFIC OPPORTUNITY TO LIVE ON A DEAD END COURT IN ONE OF TOWSON'S GREATEST NEIGHBORHOODS!! 5K Price Reduction! Best deal in Neighborhood!! Beautiful End of Group townhome in gated Dulaney Towers community. 3 Bedroom, 2 Full and 2 Half Bath. Recently painted & carpeted, updated kitchen (S/S Appliances) and recently updated doors and windows. Beautiful eat in Kitchen with updated cabinets and countertops off of wide entry foyer w/ half bath. Grand, open concept living room & dining room filled with light from huge rear windows. Upper level has 3 spacious bedrooms with 2 updated Full baths. Master has plenty of space and walk in closet. Lower level family room is huge with utility room & laundry. Basement has tons of storage space. Basement also contains full height flat walkout to patio and wide open green space in rear and side. Community amenities include security gate, tennis courts, pool, playground and lawn maintenance. Condo fee covers water, trash, snow removal, lawn maintenance, pool, parking, tennis courts. Super easy access to 695, 83, Minutes to Towson, shopping and public transportation, Restaurants, 15 Minutes to Downtown Baltimore. Charming ALL brick, single family home in Rodgers Forge! Come see this 3 bedroom, 2 bath home with features that include: hardwood floors throughout, gas heat, gas dryer (2018), gas hot water heater (2018), new gas cooktop as well. The windows have been replaced, the sewer line to the street has been replaced, and a new electric box too. There is also a new parking pad out back next to the inviting Gazebo! The house has recently been professionally painted! Nicely sized master bedroom with master bath, crown molding, chair railing all in a great location, walk to the tot lot, stores, restaurants and enjoy everything Rodgers Forge has to offer! An absolute gorgeous 3 bed 2 bathroom rancher is now available in Towson. This home is immaculate. Hardwood floors throughout the main level. Lots of windows provide great natural light throughout the day. This home features an updated kitchen with granite counters and stainless steel appliances. New roof and exterior paint. Heated floors. New central HVAC system and water heater within the last 5 years. Two additions on the home within the last 5 years. The master bedroom has vaulted ceilings, skylight, and sitting room. Both bathrooms are updated. The home also has an amazing sunroom, which serves as the perfect spot to relax and enjoy a great book! Privacy fence and patio compliment the great backyard. The carport can also be easily turned into a two car garage! Do not miss your chance to see this home. It will not last long! Classic, newly renovated stone colonial home in the heart of West Towson on a beautifully landscaped corner lot. Updated kitchen with new cabinets, granite countertops, stainless steel appliances and breakfast bar. Newly refinished hardwood floors, wood burning fireplace, charming side patio. 4 bedroom, 3 1/2 baths. Walk out basement with garage, newly asphalted driveway, brand new HVAC, new washer/dryer on main level. Large, 14 x 32 open room on upper level with new carpet and window seat, ideal for many different uses. Walking distance to Y rec center, playground and downtown Towson. School district with blue ribbon recognition. Absolutely charming rancher in sought-after Ruxton Ridge. Very large living room with wood parquet floors and a whole wall of beautiful built-ins. Enormous dining room with wood beams, parquet floors and a large brick fireplace (same size as living room!). Adjacent to the kitchen, this room could also be an incredible family room. Large eat-in kitchen with two walk-in pantries. Master bedroom with en-suite bath, two other nicely-sized bedrooms and a hall bath. Hardwood floors throughout the bedroom area. Lower level has a finished room and loads of unfinished space. Leave as storage, or add rooms to this already spacious house. Oversize 2-car garage, and a lovely lot complete this very special home. Must see! This end-of-group town home features 3 bedrooms, 2 full and 2 half baths, and over 2,000 square feet of finished living space. On the main level is a remodeled kitchen with maple cabinets, granite counter tops and tiled back splash. A large window brings lots of natural light into the kitchen. Just off the kitchen is an open living room/dining room that features a wall of windows. There is brand-new carpet in this room and throughout the house. Nearby is a powder room and coat closet. There are three freshly-painted bedrooms on the upper level as well as two full baths. The master has a walk-in closet; there is ample closet space in all bedrooms. You will find new carpet in all three rooms. Also on this level are pull-down attic stairs. The finished lower level has a walk-out to a private patio as well as a wood-burning fireplace. Also on this level is a powder room and laundry room as well as an additional storage closet. This home is heated by natural gas. The homeowner has one assigned parking spot and plenty of guest parking. The monthly condo fee covers lawn mowing, landscaping, snow removal, maintenance of the exterior (including roof, gutters, downspouts, shutters, steps, porches ~) and more. Amenities in Dulaney Towers include an outdoor pool, wading pool, tennis courts, basketball courts and a playground for the little ones. This is a gated community with 24-hour security. Towson offers a lot to do including an array of restaurants and bars, malls and shopping centers, a movie theater ~ all close by. And a little farther away is the Loch Raven reservoir where you can go hiking or mountain biking. We are minutes from I-695, I-83, and public transportation. PICTURE PERFECT 1938 Nursery Stone Cape Cod in the very desirable West Towson neighborhood. Shows like a page out of a high-end home magazine and even better looking in person--the photos don't lie! Spacious 2100+ square feet of living space with a main level bedroom suite, new quartz kitchen countertops, original oak hardwood floors throughout, a large upper floor master with attached nursery/den, a fully finished lower level family room & playroom (29'x22'), and a 32' tiered deck opening to a gorgeous landscaped yard w/specimen trees and plantings. Don't miss this one-of-a-kind home. Brick home on cul-de-sac in the heart of Four Winds neighborhood of Ruxton on large lot. Large inviting living room , dining room, eat in kitchen and family room addition on main level. 2 Bedrooms and 1 full bath on main and 2 large bedrooms plus 1 additional walk through bedroom on 2nd level as well as full bath. Sold as is. Come see this spacious and bright, well-maintained, true five bedroom / three full bath home in Village Green community. An absolutely lovely split, situated on .23 acre level lot. Fantastic location, with-in walking distance to Riderwood Elementary and Valley swim and tennis club. This home is beautifully updated....renovated eat-in kitchen with quartz counter-tops and recessed lighting, newly refinished hardwood floors, replacement windows, tastefully decorated and freshly painted with neutral decour throughout, The elevated rear deck made of AZEK decking is maintenance free and has vinyl railings. You'll love all the natural sunlight on both levels! The spacious family room with wood-burning fireplace is a great place for friends and family to gather. The utility room has plenty of storage space, and a convenient side entrance. This lovely house is Move-In-Ready and waiting for your family to call it HOME! Deceptively large West Towson home on a huge level lot. Wonderful tucked away peaceful street. Amazing amount of space in this home that was more than doubled in size a few years ago -- Perfect for multi-generational living. First floor features Living room, dining room, three bedrooms, two full baths, two family rooms and a large open kitchen. Master suite on main level with full bath. The breezeway was converted to a sunroom or mud room. Find two more bedrooms upstairs and another full bath. Corian counters in kitchen, space for a table seating at least 6, and sliders to yard. Unfinished lower level with some framing for rooms. Unbeatable location. Spacious bungalow right in the heart of Towson and just several blocks from the university. First Floor has gorgeous hardwood floors, updated Bathroom and freshly painted Bedrooms. Second floor could be a self contained in law suite with separate staircase entrance. There is a double garage and driveway with access from Maryland Ave. Enjoy the privacy of a fully fenced yard with above ground pool. This is a wonderful opportunity. WOW! This is the one for YOU! A spacious and sunny 1 bedroom, 1 bath condo in the heart of Towson.Tastefully renovated kitchen and bath, all new closets, fresh paint and more. AND a gorgeous view from EVERY window plus a large balcony accessed from bedroom and living room. Just the perfect HOME for YOU. Come and take a look..